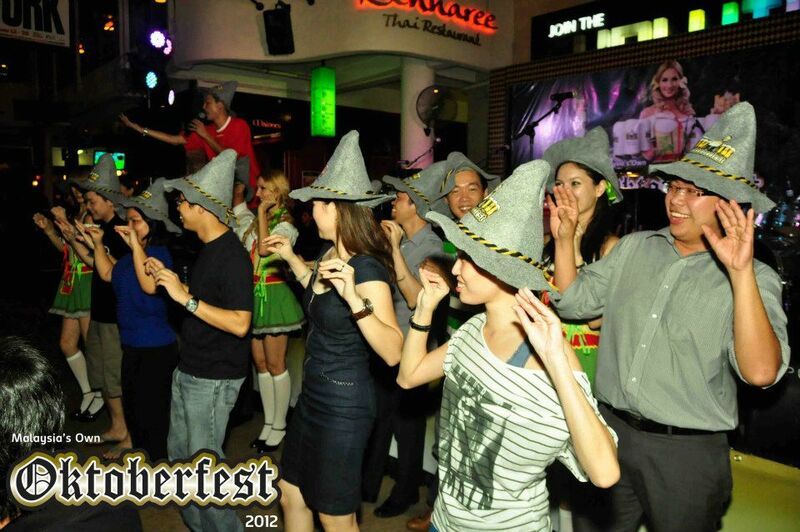 “Malaysia’s Own Oktoberfest 2012” has finally arrived. Brought to you by Carlsberg Malaysia, the beer festival runs from September 26 to October 7 at various locations around the country, and for the first time both Sabah and Sarawak are included as well. So everyone can join in with the Oktoberfest cheer. The history of Oktoberfest can be traced all the way back to the 1800s. It’s a 16-18 day beer festival held annually in Munich, Bavaria. It usually runs from late September to first weekend of October, it’s the world’s largest fair attracting over 5 million attendees yearly from all over the world. 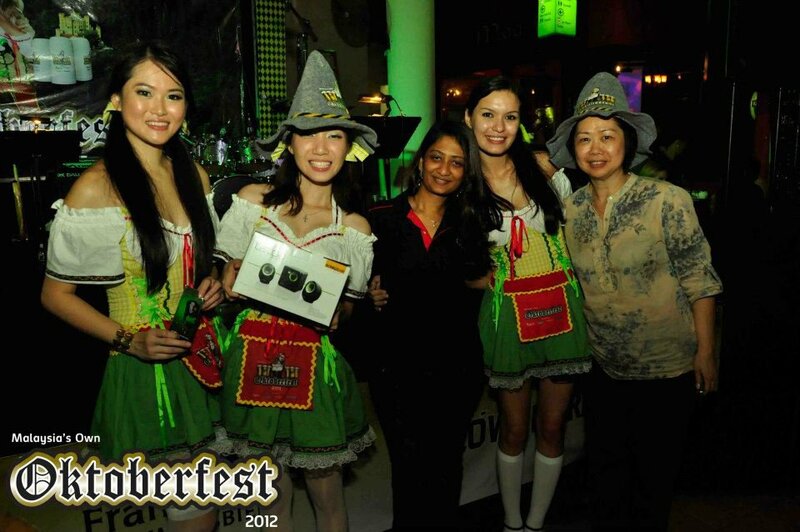 On Friday night, I went to Brussel’s, Jaya One, to celebrate my first Oktoberfest party. I was pleasantly surprised at how grand the celebration was. Brussel’s looked completely different. A big stage was set up at the outdoor area, the outlet was full to the brim, music was at full blast and, of course, everyone was enjoying the food, beer and conversations. 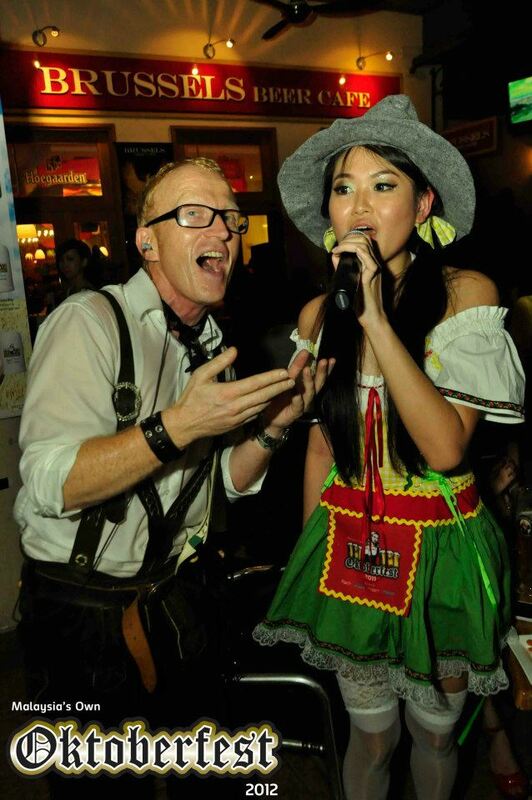 I was also given an opportunity by Malaysia’s Hottest Bloggers to wear the dirndl (the traditional German dress) and transformed into Miss Helga for the evening. That definitely attracted plenty of attention from the crowd. Hello! My name is Helga, from Bavaria! 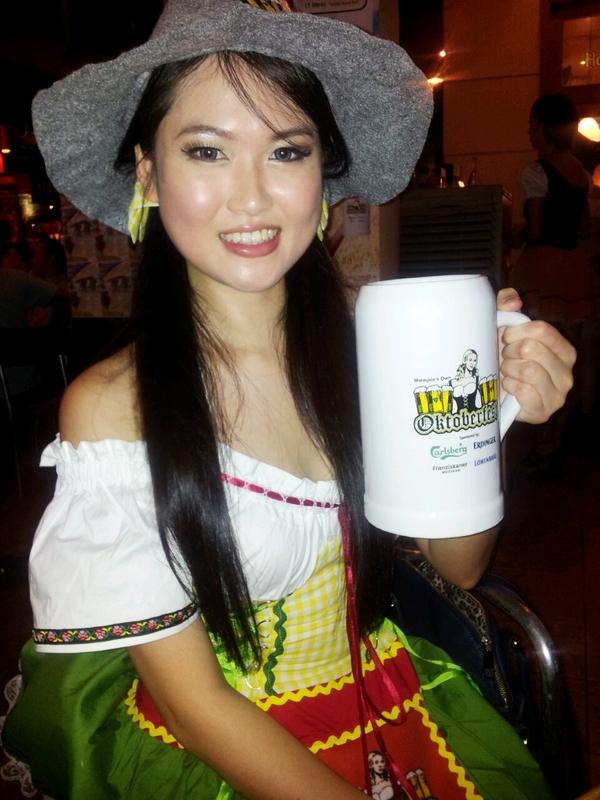 The Beer Stein holds 1 litre of beer. You’ll definitely need some strong arm muscles to hold more than one! I think I would need to train before challenging 3 at a time. It’s a workout carrying those things. By the way, all customers have the opportunity to bring back this specially designed, limited edition Oktoberfest beer Steins from the participating outlets. Carlsberg (5% ABV), a lager beer originating from Denmark, founded by J.C. Jacobsen in 1847. Erdinger Weissbier (5.3% ABV), has been around since the 70s, it’s from the first German wheat to be distributed nationwide in Germany annually. Brewed according to traditional recipes, Erdinger has no preservatives, additives and pasteurization, complying with the Bavarian Purity Law 1516. Franziskaner Weissbier (5% ABV),more than 600 years old, this is a traditional Bavarian wheat beer which is refreshing and aromatic in character. This Bavarian beer is naturally cloudy and copper-coloured and you’ll expect a sweet malt taste with a smooth creamy texture. Lowenbrau, (5.2% ABV), a famous Oktoberfests’ beer, it is said to be the original “German Munich Beer”. It is a lager beer that is refreshing with a taste of malt and mild hop bitterness. Light tasting, bright golden yellow in colour: It’s the authentic Bavarian drinking experience. My personal favourite. Though I’m not a beer drinker as such, this was special. Chicken Dance is addictive… and fun! The party kicked off with us doing the infamous Chicken Dance, it was easy to learn and soon we had everyone participating too. A little exercise before we got to sample the frothy offerings etc. Here’s a whole bunch of people doing it! I loved the Umpapa band, who came all the way from Germany, with their own distinctive sound. They even had the traditional leatherhosen on! The lead singer worked really hard to encourage crowd participation and had us all on our feet most of the evening. All of them sing… even the drummer! 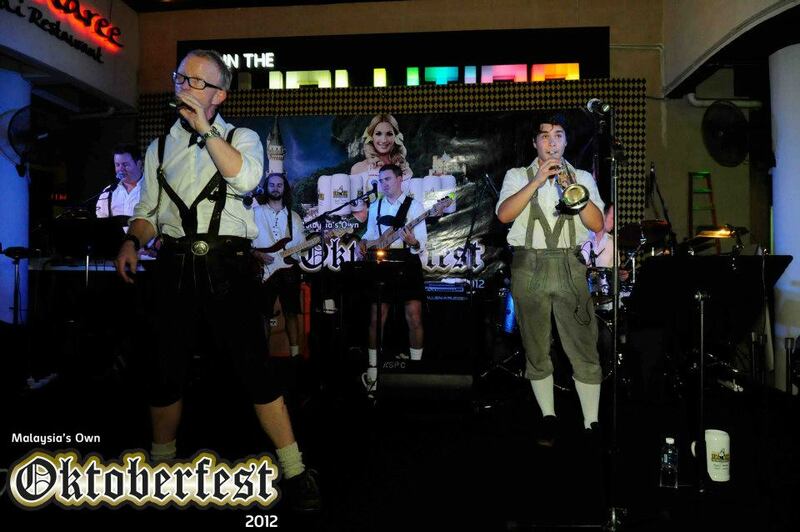 They performed a lot of well-known rock songs as well as some traditional German songs. I burst into laughter when he did Oppa Gangnam Style in German…. or was it Gibberish? Not so funny when I found out we were to do the dance though…. Naomi aka Heidi was the other MHB dressing up as a German girl. I even had the mic for a minute singing along with them (definitely the highlight for me, marginally better than being forced to do Oppa Gangnam Style on stage). My moment of glory…. albeit short. Oh by the way, I sucked at Arm wrestling. But then again, I was handicapped being left-handed (excuses, excuses). Defeated in less than 30 seconds…. And don’t underestimate Naomi, who was the overall winner! The winner (Naomi) received a set of swanky speakers. 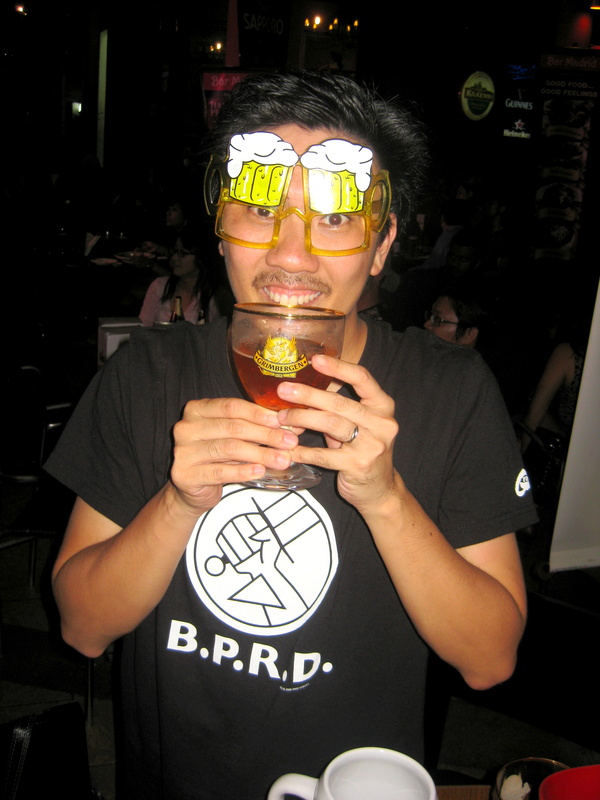 Meet Michael Cheang, KL’s leading beer expert, whom you’ll see at almost every beer festival was wearing his awesome beer goggles. He’s definitely no stranger to Oktoberfest, having visited Germany for the real thing, and was enjoying the whole buzz, saying: “The Beer is definitely better here!” Er, he even missed the Arthur’s Day celebration for this. Here’s Michael at work, doing his product sampling. I managed to speak to a few first-timers at the event and they were thoroughly entertained, especially by the live band. I would agree with them too, they blew our socks off, amongst other things. The rest of the time, I was hanging out with these gorgeous ladies from Malaysia’s Hottest Bloggers. Met Careen (First on Left) and Stephanie (Right) for the first time, and Emma for the second time. And of course, the obligatory group pic! There is still one more week of activities. Make sure you don’t miss out on them! Who knows, you might get to see Helga in person again. Thank You Carlsberg for a remarkable and memorable evening. Full marks for everything. Remember, Always Enjoy Responsibly. Don’t drink and drive! My choice of poison is always wine. That’s why I only managed two beers that night. Hehehe. But it was fun nonetheless with the dancing and games. Oomph pha pha!!! You look so pretty in the outfit!!! Sure is a fun event and you look gorgeous in your outfit.